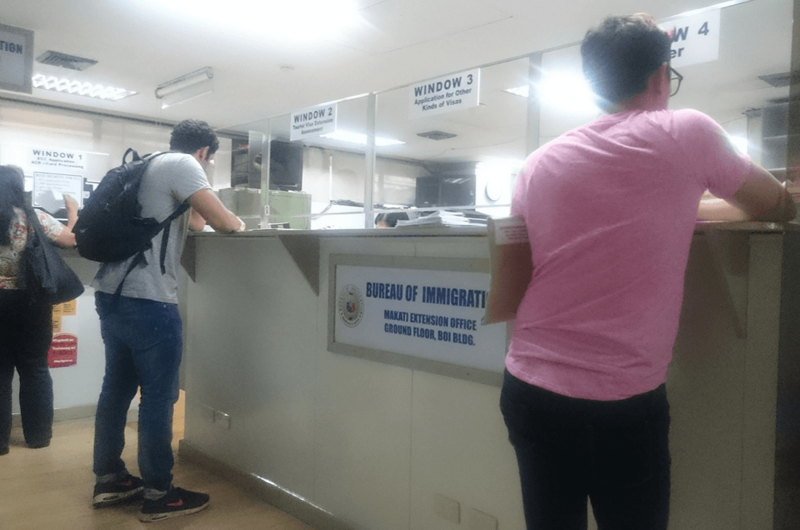 Last month, I took an initial extension visa at Bureau of Immigration (BOI) in Makati. Here is the whole process for me not to forget the failure. I took 1 month VISA WAIVER which is for an initial extension of 29 days for tourist. Here is the list I always bring for visa application. * Enough pencils are not available at immigration. Firm sheet for writing is also helpful since desks are very few. ** If ID photo is smaller than 2 x 2 inches, it might be declined. I tried a smaller photo twice and it was rejected in the second time. In case your photo is not accepted, Kodak shop is available near Jolibee at Makati Ave. But I don’t recommend it. Because they may ask crazy high price like PHP1,400. It can be less than PHP100 in other malls. At last, don’t forget to check if you are not wearing shorts or sandals. Those are not allowed. Here is the whole process. I added a timeline to each process. This time, 7 people were waiting earlier. Go inside and we can see 4 windows (window 1 to window 4). Then wait until our number is called there. Wait until they call our name in the room. In total, it took about 1 hour this time. If it’s afternoon, it may take more time. And lunch time should be avoided. They take noon break from 12nn (although the poster says they don’t take noon break). 2/29/2016: Remove process to get number.